THANK YOU STILL ON HANGER. 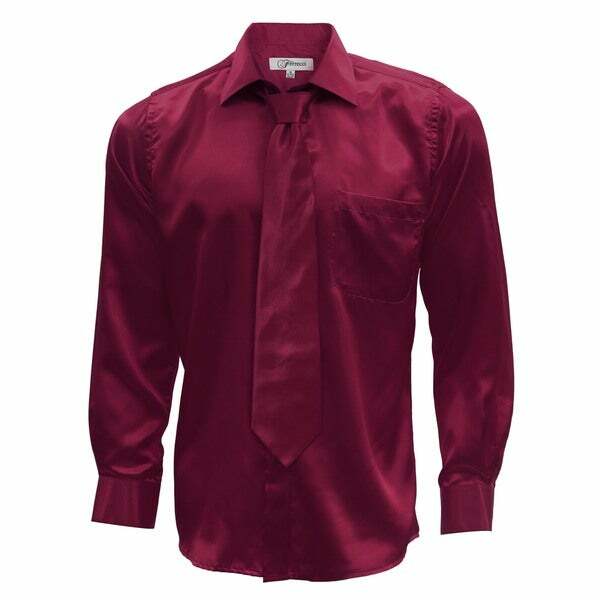 Turn heads at your next event in this satin dress shirt, necktie, and hanky set. Sharp, sleek, and vibrant, this set delivers a cohesive look for a plethora of formal occasions. Purchasing this satin shirt and tie set was a smart decision for me. I usually wear a white shirt and tie for business but was l wanted to try something a bit more classy. This set surely worked out very well for me. When I wasn't getting compliments for it I noticed how people were keen I giving my clothes a second look. It sure feels nice climbing out of a mediocre look with these clothes. I am truly satisfied with this purchase and will keep trying to obtain this item in some of the other colors offered such as the set in turquoise. This is an expensive looking shirt and feels like real silk. Can fool anyone about the price. this shirt is rich andcustom looking -I HAVE RECIEVED MANY COMPLIMENTS ON IT-DEFINITELY A SHIRT THAT GETS NOTICED ITS NOT THE ORDINARY VARIETY YOU SE IN THE MORE COMMON BOX STORES THIS SHIRT WILL SET YOU APART-FOR SURE!! Very nice satin shirt. My husband love it .. This is a really nice shirt . . . I bought this shirt for my son. It is really beautiful and he loves it The same shirt sells for more than 3x than what I paid here. Nice clothing material used and recommendable for special occasions. Not what I thought it would be. Cheaply made product. It's a good shirt for what I needed it for. Came quick to. Wanted a flashy shirt to wear with a black suit. I love my husband in this color and he shares with me.